Both President Trump & Special Counsel Mueller worked the 9/11 Ground Zero Crime Scene and covered up what really happened there on that horrible day of Shock & Awe! 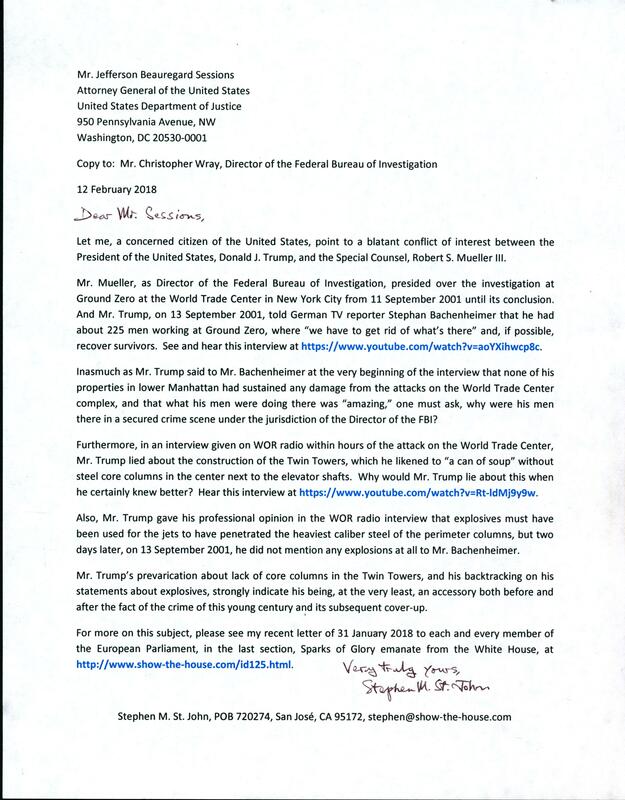 My letter to Attorney General of the United States Jeff Sessions will hopefully cause a new and a real investigation of 9/11. UPDATE 13 March 2018: There has not been any reply from the office of the US Attorney General. Transcripts of the two interviews with Donald J. Trump which are mentioned in my letter to AG Sessions are provided below. Let me, a concerned citizen of the United States, point to a blatant conflict of interest between the President of the United States, Donald J. Trump, and the Special Counsel, Robert S. Mueller III. Mr. Mueller, as Director of the Federal Bureau of Investigation, presided over the investigation at Ground Zero at the World Trade Center in New York City from 11 September 2001 until its conclusion. And Mr. Trump, on 13 September 2001, told German TV reporter Stephan Bachenheimer that he had about 225 men working at Ground Zero, where “we have to get rid of what’s there” and, if possible, recover survivors. See and hear this interview at https://www.youtube.com/watch?v=aoYXihwcp8c. Inasmuch as Mr. Trump said to Mr. Bachenheimer at the very beginning of the interview that none of his properties in lower Manhattan had sustained any damage from the attacks on the World Trade Center complex, and that what his men were doing there was “amazing,” one must ask, why were his men there in a secured crime scene under the jurisdiction of the Director of the FBI? Furthermore, in an interview given on WOR radio within hours of the attack on the World Trade Center, Mr. Trump lied about the construction of the Twin Towers, which he likened to “a can of soup” without steel core columns in the center next to the elevator shafts. Why would Mr. Trump lie about this when he certainly knew better? Hear this interview at https://www.youtube.com/watch?v=Rt-ldMj9y9w. Also, Mr. Trump gave his professional opinion in the WOR radio interview that explosives must have been used for the jets to have penetrated the heaviest caliber steel of the perimeter columns, but two days later, on 13 September 2001, he did not mention any explosions at all to Mr. Bachenheimer. Mr. Trump’s prevarication about lack of core columns in the Twin Towers, and his backtracking on his statements about explosives, strongly indicate his being, at the very least, an accessory both before and after the fact of the crime of this young century and its subsequent cover-up. 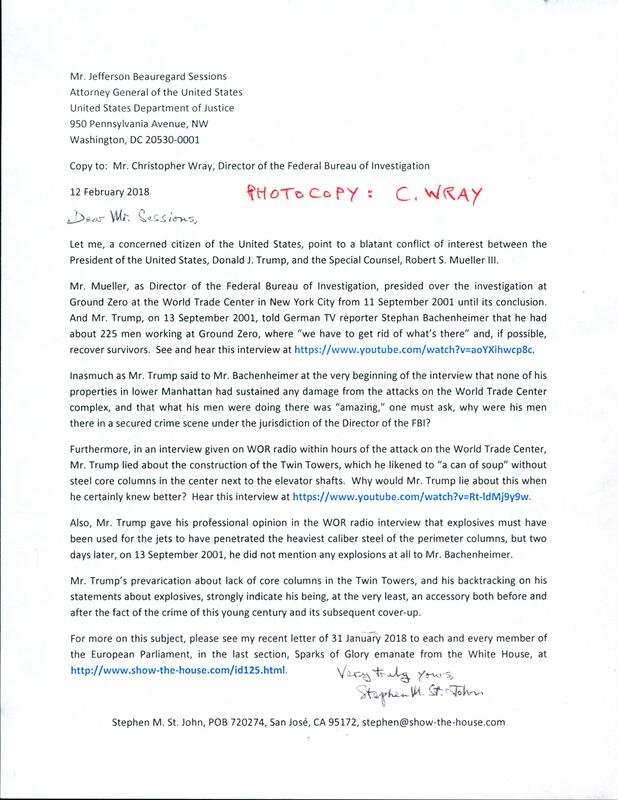 For more on this subject, please see my recent letter of 31 January 2018 to each and every member of the European Parliament, in the last section, Sparks of Glory emanate from the White House, at http://www.show-the-house.com/id125.html. Stephan Bachenheimer (SB): Mr. Trump, do you have any interest in the area down there that’s been affected? SB: What’s your biggest fear, Mr. Trump? DT: Well, I just went to what they call “Ground Zero.” I’ve never seen anything like it – the devastation, the human life that has been just wasted for no reason whatsoever, ah, it is a terrible scene, a terrible sight, but New Yorkers are very strong and resilient and they will rebuild quickly. SB: Mr. Trump, what should be the response to this attack? How should the US respond to such a devastation? DT: Well, I think they have to respond quickly and effectively. They have to find out exactly what the cause was, who did it, and they have to go after these people because there is no other choice. And then, secondarily and much less importantly, we have to rebuild in some form that will be just as majestic as the World Trade Center. SB: Will you be involved, will you take any efforts, any steps, to reconstruct the area? DT: Well, I have a lot of men down here right now; we have over a hundred and we have about one hundred and twenty five coming, so we’ll have a couple of hundred people down here, and they’re very brave and what they’re doing is amazing, and we will be involved in some form in helping to reconstruct. SB: What kind of cost would you estimate to rebuild this area? How much money has been lost in the attack? DT: I would say fifteen to twenty billion dollars. You’re talking billions and billions of dollars, and it’s irreperable. Irreperable. But I really feel that the location is such, and the importance of the monument is such, that we have to rebuild. And again, not necessarily in the form of the two towers, but something has to be done that’s very big and very majestic. SB: A lot of people ask, how is it possible that a Boeing plane would be able to destroy the, or two planes, would be able to destroy the Twin Towers? Because they were constructed to withstand, like a 707 attack. SB: When do you think you will start to rebuild? DT: Well, I would hope it would really be very quickly, a lot of great genius people in this city, and I think that within a shorter period of time than, first, we have to get rid of what’s there, and we have to save as many lives as possible, if that is possible – today they found five people under the rubble, which is amazing, alive -- but after that process takes place, I think they can start thinking about rebuilding, absolutely. SB: Viel Danke, Mr. Trump. Alan Marcus: Donald, you’re probably the best known builder – particularly of great buildings in the city – there’s a great deal of question about whether or not the damage and the ultimate destruction of the buildings was caused by the airplanes, by architectural defect or possibly by bombs or aftershocks. Do you have any thoughts on that? Donald Trump: Well, it wasn’t an architectural defect. You know the World Trade Center was always known as a very strong building. Don’t foget, that took a big bomb in the basement. Now the basement is the most vulnerable place because that’s your foundation. And it withstood that. And I got to see that area about three or four days after it took place because one of my structural engineers actually took me for a tour because he did the building. And I said, “I can’t believe it!” The building was standing solid and half of the columns were blown out. So, this was an unbelievably powerful building. If you know anything about structure, it was one of the first buildings that was built from the outside. The steel – the reason the World Trade Center had such narrow windows – is that in between all the windows you had the steel on the outside. See, you had the steel on the outside of the building. That’s why when I first looked – and you had big, heavy I-beams – when I first looked at it I couldn’t believe it because there was a hole in the steel, and this is steel that was – you remember the width of the windows of the World Trade Center, folks? – I think, you know, if you were ever up there, they were quite narrow and in between was this heavy steel. I said, “how could a plane, even a plane, even a 767 or 747, or whatever it might have been, how could it possibly go through the steel?” I happen to think that they had not only a plane but they had bombs that exploded almost simultaneously. Because I just can’t imagine anything being able to go through that wall. Most buildings are built with the steel is on the inside around the elevator shaft. This one was built from the outside, which is the strongest structure you can have, and it was almost just like a can of soup. AM: You know, Donald, we were looking at pictures all morning long of that plane coming into building number two. And when you see that approach the far side, and all of a sudden, within a matter of a milisecond, the explosion pops out the other side. DT: Right. I just think that there was a plane with more than just fuel. I think, obviously there were very big planes. They were going very rapidly, because, I was also watching where the plane seemed to be not only going fast, it seemed to be coming down into the building, so was getting the speed from going down hill, so to speak. It just seemed to me that to do that kind of destruction, is even more than a big plane. Because you are talking about taking out steel, the heaviest caliber steel that was used on the building. These buildings were rock solid. And, you know, it’s just an amazing, amazing thing. This country is different today. And it’s going to be different than it ever was for many years to come. AM: A very profound statement, and very true.